This web site allows anybody to buy, sell and swap Meccano items from any period. You can advertise your sales and wants on this page free of charge. This applies to Meccano dealers as well as private individuals. This site is read by hundreds of Meccano enthusiasts, so if you are selling your childhood Meccano on here, you can rest assured that it will go to a good home! If you have any Meccano to sell, or are looking for parts, outfits, literature, etc. Read the rules below and then Click Here to place your FREE advert! I reserve the right to edit adverts for space, clarity, factual errors, spelling, punctuation, etc. and to place them into whichever category I see fit. Adverts will appear until you request them to be removed, or usually after about 6 - 9 months, when we've all got tired of looking at them! If you sell an item, or no longer need it, please contact me so that your advert can be marked as 'Sold' or ammended. All sellers' identities are removed from items which are sold. Sellers please note: All replies to your advert will come directly to you as ordinary email messages. There is no need for you to visit this, nor any other web site to view the replies. Buyers please note: If an item has been sold but not marked as 'Sold', then it is because the seller has not informed me. Unfortunately, I am not psychic and I am not going to continually contact every advertiser to ask whether their item has been sold yet or not! This site is only an advertising facility and takes no part in private transactions. Readers are responsible for their own transactions with other people. Buyers should satisfy themselves as to the condition of any item before purchase, and always be wary of sending money to strangers. Sellers should never part with an item until they receive cleared funds. If you spot an advert that you think is bogus, please let me know, along with your reasons. These simple rules are mostly to help save my time and make my job easier. I devote my time freely to this site and all adverts are free, so please help me out as much as you can! 2 Please do not use all capital letters, as it means I have to re-type the whole thing. Your advert will not appear in all-capitals. If I have to do extensive re-typing, I may ask you to resubmit. 3 Meccano constructional items only. No look-alike systems, and no Dinky toys, Hornby trains, or other peripheral stuff. Sorry, you have your own fansites! 5 If possible, attach a SINGLE PHOTOGRAPH (jpg or bmp) of your item for sale. If you wish, the photograph can be a composite of multiple shots, but there is only space on the page for one photo per advert. If you send me more than one photo, I will decide which one I think is most suitable, and will not change it, due to the work involved in processing it, cropping it, resizing it, and adding it to the site. So do not send me multiple photos and then complain that I've used the wrong one!. 6 Please attach your required photo directly to your email (jpg or bmp). Please do not send me a link to a photograph album on a web site so that I have to go searching for it amongst hundreds of adverts and then work out how to download it. Any photos not sent directly will be ignored, but I will still post your advert for you. 7 Please do not send me massive files over 10MB, consisting of mulitple photos which I won't even be able to use! A single photo should be no more than 1MB. 8 'Wanted' adverts are for items which are not easily obtainable for a reasonable price elsewhere; not for common items which you could easily find on ebay or from any dealer. Do a bit of research first. I just had somebody wanting to place a ridiculous advert for two ordinary 5 1/2" Strips!! These exist in their hundreds of millions! 9 I no longer accept adverts for Meccano Magazines, unless they are pre-1930, or you have a compete set, or a very long uninterrupted run. Experience has shown that Meccano Magazines hardly ever sell. The reason being that all Meccano Magazines from 1916 to 1981 are freely available to read on the Internet, copies of all of them can be bought on DVD for a few pence, the magazines are not particularly rare, and they are heavy and cost a fortune to post. It's a pity, but I'm afraid that's the situation with these old mags. I will however, accept Wanted adverts from anybody who wants to complete their MM collection. 10 Maximum of five free adverts per person at any one time. 11 This is an English language web site - adverts in English only please. If you have more photographs available, mention this in the advert. State the condition, as it might not be obvious from the photo. 'Sensible offers' usually means 'I want too much money for this'! The buyer's idea of a 'sensible offer' might not be the same as yours! A lot of adverts with 'Sensible offers' remain unsold and, I suspect, don't get any response. I know of advertisers who have changed 'Sensible offers' to 'Offers' and their item sold straight away. If you don't know the value of your item(s) just ask for offers. You will usually get a fair price, especially if you have competing offers. I will leave the price off adverts for items which are ridiculously overpriced. Nobody will be interested in them, and it is wasting my time, your time, and everybody else's in publishing them. This is in your own interest as otherwise you will not get any replies! I once had somebody trying to sell a tatty 1975 Clockwork Motor for £220! (Real value less than £5 at the time!). I understand you may not be sure of an item's value, so just ask for offers and take the highest one. Be aware that the value of old Meccano sets is mostly in the boxes and packaging, as these are usually thrown away, therefore rare. The metal parts usually last forever, and most of these were made in their millions, or are still being made. So if you have a shoe box in the garage full of rusty or bent parts, it probably won't be worth the price of the postage. Make the most of your photos by cropping out all the background from around the edges. To save needless correspondence, you should state which location and/or country you come from, and whether you are prepared to post items, or expect the buyer to collect. If you want the buyer to collect, you should always mention where from. "Buyer must collect" is meaningless without stating where from, as you could be in Outer Mongolia! As this is a UK site, and the UK has always been seen as the 'Meccano capital', buyers will probably assume that you are in the UK, unless you state otherwise. 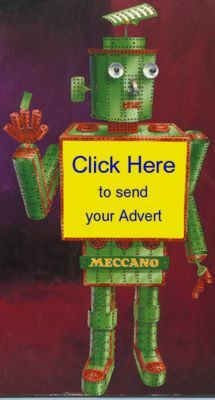 Thank you for your adverts, and for making this the best and busiest Meccano advertising site on the Net! To qualify for inclusion in this section, outfits must be complete in proper cabinets/cartons, and not just a collection of parts in a home-made box! An English blue and gold 1930s outfit 10, in original box. The box has been partially restored. Comes complete with original small parts boxes, flywheel, digger bucket and boxed E120 and No.1 motors. Also includes No.2, 5, 7/8 and 9/10 instruction manuals, How to use Meccano parts and 1930s Mechanisms manuals. In very good condition. £2,300 or nearest offer. More photos available on request. Please contact Lesley by email or 07583082330. Buyer to collect from Rotherham area or mutual meet. Purchased in the early 70's but only used a handful of times. It is complete to the best of my knowledge. The original folder and instructions are all in perfect condition. One careful owner from 1950s! Comprises sets 5, 5a, 6a, 7a, and 8a. Complete in original boxes and manuals. All the right pieces - though not necessarily in the right places (see photo). Meccano No.9 set in original carton but missing lid. The parts are in the lighter shades of red & green and have been used but are in good condition. The set has a few missing parts: hanks of cord and ball bearings are not present, I cannot find the box spanner and have not counted the nuts bolts and washers, apart from these the set is complete as per the late 1950s list but also has some later parts eg plastic flexible plates and narrow strips. The manuals include a Mechanisms Manual from the 1960s, No.9 Manual dated 1954 and No.7/8 Manual from 1957. The photo shows only the top layer other photos available by email show the bottom layer with long angle girders (4) and strip plates (6) etc. The parts are in very good condition having been restored in medium red/green with a very good colour match to the original. The set comes with an E15R electric motor and instructions books as shown - the green folder of No. 10 instructions contain set 10.1 to 10.12 and the instructions for set 9 leaflets - there is some extra literature and a lot of Meccano Magazines from the 1940s and 50s. Also 9 and 9a boxes, although original and a bit tatty (9 box top has been mutilated) are available. The 9a box is shown under the manuals. Mid red and green Meccano No.10 set in very nice condition, totally complete. With quite a few extras including 2 clockwork motors, some period Meccano Magazines and instruction manuals. All the girders and flexible plates are straight and none have been bent or creased some very minor paint loss, it has had very little use. The whole set is housed in a very nice craftsman made oak-faced four-drawer cabinet to the original dimensions but to a better standard than the original. Full set of photos on request. Will pack and ship anywhere at buyer's cost. Priced to sell at £1795. I have a red and green Outfit 10 which has never been taken out of the box. My Meccano set from when I was a child (1960s) in its original wooden cabinet. I made a crane with this - some parts used, and some unused. Collection from East Devon, or a delivery in the South West/Bristol/London areas might be possible on request. Mecccano set No.10. In original wooden box. One careful owner from new. 1950s set should be complete, or almost complete, with original set 10 construction diagrams and booklets, plus additional nut holder and screwdriver. Later motor also included but probably needs attention to gearbox if memory serves. Further images can be supplied on request. Contains silver/ yellow/blue/black.in a very good condition. Lots of parts unused and most, if not all, strniging cards present; some components still being tied on. It comes with Meccano manuals leaflets 1-20 and booklets, two transformers input 220/240 volts and two motors electric 15 Volts are included. Photos available on request. Weighs 35kgs approx.and is located in Nairobi, Kenya. £1300. Willing to pack and ship anywhere (at buyers expense). I have a fairly large collection of Meccano, starting with a Red and Green Set Ten in the Wooden Box with lift out drawers, a Set Nine collection in yellow and silver, many smaller boxed sets, some never opened, and hundreds of spare parts, (a lot collected from incomplete sets, but many purchased reproductions), plates, strips, greenware, brass parts, motors etc. All of the spare parts are stored in metal or plastic containers. If interested I could try and list the kits etc. I live in Guelph Ontario. Collection would have to be picked up, shipping would be impossible. c.1949 Meccano No.9 outfit in deluxe wooden cabinet. As the image shows this set is in overall very good condition. Complete with all 4 small parts boxes and correct 6,7-8,and 9 manuals and even has the original crocodile cards. The cabinet also has the original key included. 1950s red and green No.10 outfit in original cabinet. Housed in its original 3-tier cabinet. Overall a nice useable set. Price to sell at only £800. Exceptional early 1950s mid red and green Meccano No.10 set. Totally complete and obviously, by its condition has had very little use. All parts are stamped 'Meccano, England' and show no sign of being bent or creased. Some minor paint loss, which is to be expected on a set which is now nearly 70 years old. No parts have been repainted and it comes complete with quite a few additional parts, several manuals, including the one for Set 10. Two clockwork motors and a complete set of Meccano Magazines from January - December 1951, which make for very interesting reading. The whole set is presented in a beautifully, craftsman-made, hardwood four-drawer cabinet, which has removable green drawer liners. Full set of photos can be sent on request and I am prepared to pack and ship anywhere, at the buyer's expense. There can be very few early sets available in this condition and at this price. The set seems complete, however not all parts are correct for the period. Best offers over 500 (£450) please. Meccano No.10 set from the early 1950s in a reproduction chest with two lift-out trays. The set is complete and the parts are in good used condition. About 10 of the curved strips and girders are from another set and have been repainted for colour matching. An original instruction book is included. The small parts boxes are reproduction and are filled as set out in Greg Rahn's web pages. There are more pictures on Gumtree. If you want more information or pictures please contact me. I would prefer the buyer inspects and collects but I am prepared to post anywhere in the world at cost. Replica of the 1950s Meccano Outfit No 9 set chest in Cherry or Pine, with a lift-out tray. They are 20 ½ x 14 ¼ x 4 7/8 deep ( 520 x 363 x 122 mm). One is made with a ½ Cherry frame, with a plywood top and two have a Pine frame. The tray and partitions are similarly made of cherry or pine. They have inset brass handles, solid brass hinges and are fitted with a Squires box lock. The design is half an inch deeper than the original to accommodate the Boiler in the base without a need for a cut-out in the tray. There is therefore an extra compartment in the tray. I will include the 4 replica blue small parts boxes and 6 hanks of cord as in the original 9 set with each one. The price is £225 each. If you want further information or pictures please contact me. I will post to anywhere in the world at cost plus insurance. Meccano No 10 Set in Original Box with many extras. This set is available with an assortment of motors, additional gears and many other odds and ends. Additional photographs available. Seller will deliver within a reasonable distance (about 100 miles) from Cheltenham. You can also have a box of Meccano Magazines and a couple of books if you want them at no extra cost. Offers in the region of £950. Meccano number 10 wooden chest. This chest is completely original and unrestored. The lid has some marks on it, including paint marks and the varnish is in a fairly poor state on the outside. The lock is missing and one of the two chains that hold the lid is broken. There are a couple of chips out of the wood . All can be seen in further photos that can be sent to you. Late No.10 set, circa 1980s in original 5 drawer cabinet. This set is virtually unused, plates, etc are unmarked , bright yellow plates and lighter blue parts, the zinc is bright, - most items stamped Meccano (ie French). Complete including complete set of No.10 special leaflets and other instructions. Extras include two powerdrive motors and an unopened M0 motor set and a set of Large-Tooth Quadrants with pinion, plus some compatible non-standard flat plates. Additional photos of each drawer contents available by email. Collection from Milton Keynes or mutual meet for cost of petrol. Offers are invited for my Meccano L Outfit. The outfit is believed to be 1934 or 1935. It originally came from Switzerland so is in the Export colours - girders and strips are green, rather than gold. There are many extra parts, added later, which the buyer may be interested in. Prefer collection since it is massively heavy! Meccano No.10 set in reproduction wooden chest (better quality than original). Set contains Yellow/Blue/Zinc from the 1970s. Two clockwork and one electric motor included. Assortment of Meccano booklets included. £1199. Buyer to collect from Derby area. I am selling my Uncle's Number 10 set. Few strings missing but apart from that I believe it to be complete. I have a couple of other photos so feel free to ask for them. Mid Green/Red 1950s No.10 set. This set is 100% complete down to the last nut and bolt. The box is original and in good condition for its age. The small parts boxes are also original. The No.10 manual is original and complete with sellotape on the spine. A high percentage of parts are in near mint/very good condition. The stringing card is not original and is only for appearance. Collection of this set will be Walton on Thames, Surrey. We may be able to help with collection at a mutually convenient location. Will post if necessary. Has the full instructions plus an electric and clockwork motor as part of the set. Meccano Outfit No.9 Set in excellent condition. Original wooden box and includes a few items from earlier sets. Box has minor marks from storage. Owned from new. Early mid red and green Meccano No 10 set. Totally complete with quite a few extra parts included, Although there is some minor paint loss which should be expected after 60 odd years. The set has been lightly used and remarkably not a single plate, girder or strip shows any sign of ever having been bent. The set comes complete with two clockwork motors some period Meccano Magazines and handbooks, all the small parts are housed in compartmentalised boxes for ease of use. The whole set is housed in a craftsman-made four-drawer cabinet exactly the same size as original but better quality. Will pack and send anywhere at the buyer's expense, full set of detailed photos available on request. Meccano Outfit No10 in good condition. Original wooden box and includes a number of original boxes of nuts etc. Owned by my late grandfather and not used for well over 40 years. Instruction manuals for Outfit No10, Outfit No9, Outfit No6, Block-setting Crane, and Gears Outfit A. Meccano No.9 set and one other set (not sure which one). In used condition  Im not sure if its complete. The boxes are in fair condition, manuals have loose pages. Collection from Saffron Walden Essex. Box lid missing sides, manual has loose pages. Collection from Leicester (could also arrange collection from Brighton). Meccano Centenary Anniversary Crane set. Buyer collects from Clevedon, Somerset nr Bristol. I am selling my fathers 1950s Meccano Outfit No 10 set. The set is in used condition and includes some later items including, clockwork motors and Meccano Magazines. Collection or post at buyers cost. Meccano No.9 set in original wooden chest. Set contains a Yellow/Blue/Zinc Meccano that was made in the 1970s. Set is in good condition for its age. Some parts show little sign of use and some nothing at all. Wooden chest has minor marks from storage and minor damage on one of the polystyrene trays but generally in good condition. It comes with Meccano manuals from 1 to 9 and 10kg of extra parts including 4 electric motors. Meccano number 10 set, from circa 1969. In original wooden chest in very good condition. Contains yellow, blue and black Meccano set again in very good condition, with leaflets 1-10 included. Meccano set from 1940s in red and green. Parts are in very good condition. I have been told that this is a No.8 set, but you will have to decide from the picture. More photos available. Meccano vertical boilered steam engine. This has been in my collection for roughly forty years. It has never been steamed whilst I have owned it. All parts are original. The paint work may have been touched in, in parts. £500 carriage paid in GB. A collection of Meccano odds and ends. Found during a recent clean out. If anyone is interested, please email for collection address. This is a Meccano No.5 Set, and comes with original varnished case as seen in the picture. There has been many additions to this set and it has hundreds of pieces. The Meccano Clockwork motor is in perfect working condition and has 2 keys. The lock on the case still works with the key, but needs a small repair. All parts are in fairly good condition but it has seen plentiful use over the years. Seller is in Levenmouth, Fife, Scotland. Packaged and sent to any UK destination at buyer's expense. Offers. You can email me direct. Six rare and hard-to-find vintage original Meccano Lead Weights. Part 101: Heald for loom. Qty 60 (5x12). Part 104: Shuttle for Loom. MkII? with Spool. stamped "Meccano". Part 106: Wood Roller. Qty 2. Complete with Rods & Collars. Best offers over 150 (=£130) please. Pre-war Meccano No.00 Aeroplane, complete built as a biplane in red and cream. Some paint loss as shown but generally good condition. No box, all original parts including nuts and bolts. Postage inland with insurance will be £20. Will post overseas at buyer's cost. I would like to offer my wooden storage box for sale. It says Meccano No 5 on the lid. The content is not complete but the original booklet is present. A box with instruction booklet for kit number 5 together with various parts. All in well-used, dusty, rather battered condition. I do not know if the parts match the box but am happy to provide more photos- just let me know. Accessory outfit 5A box and instruction booklet. With parts in dusty, rather battered condition. I am not sure whether the parts match the box exactly but I am happy to supply photos. I am not sure whether the parts match the box but am happy to supply photos. Box with leaflet and parts in dusty, rather battered condition. I am not sure if the parts match the box but am happy to supply photos. Mixed lot of miscellaneous Meccano in used condition. Has been in loft storage for a number of years. Age unknown but I think it's likely to be pre-war. Includes booklet with first few pages missing. Best offers over 450 (=400£) please. circa late 1941 Meccano service grey No.0 aeroplane outfit. As the image shows, the aeroplane is complete with correct service grey labelled box and instruction book also marked service grey ,with the original parts packet and brown pilot unique to this aeroplane outfit. This set must be amongst the last run ever produced as the lid has no print code or labelling to any edge of the lid. Overall a very rare item indeed. Original dealer display card circa 1928. In excellent condition. No bends or stains, both sides shown. Postage at cost  will be sent special delivery in UK. Will also ship worldwide. Price is £95 ono plus cost of postage. As the image shows, the box and contents are in very good condition, being restrung to an accurate reproduction card. Three boxes of early Meccano folgekasten 2A and 3A + a price list. Look at the picture for condition. Give me a fair offer. Shipped from Sweden. We split the cost. Pay to my bankaccount or to PayPal. Circa1933/34 No.2 Meccano Elektron outfit. This set is complete and, as the image shows, in superb display condition throughout, having the parts restrung to an accurate reproduced card. As some will probably know the large version for sale here contained a full No.1 and No.2 set in this first early version. Later No.1 and 2 sets were separated accordingly. This is considered a rare Meccano outfit. Postage worldwide at cost, very well packed and insured, or collection welcome. An eclectic mix of Meccano Aero parts. Located following a recent review of my collection. The highest offer will secure these rare items (no reserve). Prewar  belonged to wifes dad, born 1922. Clockwork motor works. Tractor tyres not in great nick. Been in storage for many years. Happy to split it but great if all goes in one lot. Bought some more for my sons in 1990s so one or two bits may be later. (tried to separate). Do contact me if you need more information. UK Hampshire near Petersfield. Don't know name or details. Inherited from my antique dealer friend. Meccano Vintage table top sign. Located in Canada, can arrange shipping. Meccano Vintage Box with some paperwork and parts. Meccano shop counter / dealer's 6-drawer sloping front cabinet. This type accepts 24.5 angle girders in the bottom drawer. Collect Only or mutual meet. 1928 Meccano Electrical Outfit X2. Best offers over 220 (=£200) please. Meccano Outfits Nos. 5 & 6. Include some extra parts, eg. 8 24½'' angle girders. Best offers over 290 (=£260) please. Best offers over 50 (£45) please. Enquire for other pictures / close ups. Steering, rear axle, wind up (no key) and hand brake fitted. Can be seen / collected West Yorkshire. Can ship by arrangement. Unsure of completeness, but possibly more pieces have been added. Collection from North Wiltshire or will discuss delivery terms. Group of Dinky Builder parts. Stamped Made in England Meccano Ltd.
A rare burgundy long-bodied M6 6volt motor in box remains. Tested and found to be in very good working order. Nice & clean, with lovely gloss paint finish with logo present to side. Cabinet has seen some damage from woodworms and needs restoration work. Best offers over 500 (£440) please. No.3 Outfit. Includes clockwork motor (pat no 21117/12) and vintage screwdriver. c.1928 Standard Mechanisms literature. Complete pages 1- 47. All are in good condition with some signs of use, I am unsure whether the collections are complete. Original boxes with some wear and tear. One instruction booklet is missing cover and front pages (starts page 13 - 172) so date/description of this booklet is unknown. Inviting offers for individual items or whole lot. More photos available on request. An extremely rare early Meccano New York Electric motor. c1915. Condition is really very good / excellent. All is clean, free moving, brushes have been cleaned. I have no idea of the voltage of this so I have tried with low voltage AC and DC and get a buzzing noise. I see no reason why this should not run with the correct input given. Offers please. Will post worldwide. Rare Meccano Elektron No 2 Outfit. Substantially complete with instructions (cover missing). Early screwdriver dating from around 1916. Please contact for any more info. 1930s Meccano No.1 upright oil can. As the image clearly shows it still has its original nickel finish with no pitting or peeling with a clear Meccano stamp to the side and the original brass stopper to the spout end. A rare item indeed. More images on request. Unknown part number but thought to be from around the 1920s due to patent Nos. on casing. Made in Liverpool. Untested as unknown voltage but possibly 4v? Im no expert but pretty sure it needs replacement brushes. Meccano parts number 61, Windmill Sails. Only three of these unfortunately. Nickel plating has surface rust and is about the same on the other sides. Will post Worldwide at cost. This belonged to a family friend. I am not an expert and there are probably other parts in an assorted box that came with it. I will try and find other parts ( if given guidance ) but this is what is for sale. As you can see from the photo it has some playwear. This can be posted or collected (Christchurch Dorset). Pre-war Scientific Hooks x 4. And Meccano Pointer, 2nd version with small boss. Pre-war Collector Shoe and Crane Grab. Part Nos.149 and 150. Unused. Offers please. More images on request. Pre-war Meccano 25 and 50 gram weights. 6 in total, all original. All original but faded in places. Postage world wide at cost. Original mk1 shuttle, reed hook, sand roller, loom healds, and wood rollers. Meccano Set of the mid-thirties originally belonging to my Father, more than 800 parts plus bolts and nuts, approximately corresponding to the contents of box No.9 plus a number of additional parts purchased for the construction of some larger projects of No.10. Full list of parts available upon request. In well-used condition, orderly stored in two custom-partitioned non-Meccano wooden boxes. Supplied with manuals for the construction of about 1000 different projects, plus miscellaneous documentation. Boxed overall weight 17 kgs. Shipment from France costing £60. Sensible offers please. For further details please email me. Zinc: 4× 7; 8× 9b; 2× 9c; 4× 48a; 2× 90; 12× 215, Red: 1× 19c; 2× 130a, Good red repaint: 2× 145; 2× 146; 2× 162; 2× 162a; 1× 162 b; 2× 167b. Checked complete other than a partial run of Manuals - Leaflets. Includes 300 extra parts and 1000 M4 paintsaver washers. Price: £950 (ono). More photos available on request. Please contact Lesley at email or by phone 07583082330. Buyer to collect from Rotherham area or mutual meet. Few bits missing but all other parts still in the box. Collect from seller, St Helens, Merseyside. Highways Multikit, Crane Building Multikit, Meccano Steam Engine, Set 5, Set 4M, Set 4, Set 3, Set 2, Gears Set, Mechanisms Set, Pocket Set. With the original instruction booklets and the Meccano Magazine from January 1978. Bought in the mid seventies  early eighties. Its been sitting in boxes for the past 37 or so years. In very good condition. All but a couple of the flat plates are still flat, I never bent and tried straightening them out. All the strips are still straight. No rust. Some of it has hardly been used. A house move is prompting me to sell it. I could post it but it's heavy, so collection from Bath (BA2) would be preferred. More pictures or details on request. Offers please. I am obliged to sell my prized Meccano Giant Blocksetter as a consequence of downsizing. The crane is based on the illustration on the front of the Meccano Instruction manuals of the 70s, so the jib is nearly 6 feet long! It is made from both green and zinc Meccano, is fully operational and appeared on Blue Peter. Free to anyone who can pick up from the Cardiff area. No instructions and some rusting. Meccano items from the 1950s and 1960s. Instruction leaflets indicate sets up to 7, plus Gears Outfit B, Mechanisms Outfit and Electrikit, but I doubt that I still have every single part from all of those sets. Condition best described as well used  parts in (non-official) 6-drawer wooden cabinet. A massive lifetime collection of Meccano. Literally 1000s and 1000s of parts from all eras. Beautifully stored sorted and arranged in a 36" mechanics tool cabinet, and two filing cabinets. Including sets, built models, steam engines, rare parts, motors, manuals, plastic Meccano (60s), mm's, etc., etc. Way too much to list here, details, lists, photos available - please email. Collection from SK13 North Derbyshire. Price £100 including economy postage in Europe. Lovely Meccano Steam Engine in superb condition. Housed in custom-made hardwood box. Complete with Meths Burner, Funnel, Drive-chain & Drivebelt, and Instructions card. Miscellaneous Meccano pieces. Not in box. Exact age unknown but most 1950s and early 60s. Also have pages 3  14 of gear set B so assume this is part of it. Condition as seen bit tatty and not brilliantly straight. To be picked up in Chesham or sent at buyer's expense. A Meccano Traction Engine in a glass display cabinet. Made by Les Nightingale of Bolton. It is a very detailed item. I can supply additional photographs if necessary. Meccano No.9 set  £250. 98% complete + extra parts. (One or two minor items may be missing e.g. cord, sprocket chain). E15R electric motor. Clockwork No.1 motor. Quality variable  some well-used but most in good condition. Collect from Birmingham or shipping at cost (~£40). Happy to provide more detailed photos. Offers invited - or maybe just a donation to the RNLI. Will put in post in exchange for £20 cheque. Meccano set number 8 plus miscellaneous parts. In seldom-used condition from the 1950s. I am based in Ilford but could travel a reasonable distance. A nice example of the 1970 Motorized (Advanced Metal Construction Set) which I believe was produced as an export set. Basically it is a yellow, black and zinc No.5 set with addition of a Power Drive motor. The set is complete with mostly original parts that are in excellent condition - many unused. The motor has been checked and no issues such as worn gears apparent. Priced at £85 (+ p&p). I have a lot of Meccano pieces, they were from my dad. I am traying to sell them. I am from Buenos Aires. I don't know the price, I am waiting for an offer from you. The shipping price must be for your own. - Site Engineering Set No.5 boxed. - Lots of additional Meccano parts. - EU1072 electric motor (untested). - 7 manuals: 13/1046/15, 13668/50, 13/368/100, 162160, 162165, 162166, 55932, 55934. Condition good but used. For more photos or questions please email me. Meccano Set 8 plus miscellaneous parts. In used condition from the 70s, in original box. Box lid has chunk missing. I have checked the contents as best I can against a parts list and the following are missing: 2 x angle girder 25hole, axle rod 11 1/2 inch, flanged wheel 3/4inch, spring, screwdriver. Also included are 2 EMPD powerdrive motors, some parts from Army Set and approx. 100 miscellaneous parts. Collection from Merthyr Tydfil preferred but I may be able to deliver in the South Wales/Bristol area. Could discuss courier delivery at buyer's expense. Meccano Lorry Crane which I built 65 years ago. Would like as near as possible to £1000. Meccano set 10 and plus many accessaries had been added. No box available since many parts were add along 45 odd years ago. All manuals and sheets of manuals were included as many as possible. Address in Sydney, Australia and pick up yourself. Large amount (7.1kg) of Meccano from the late 1950s to 1970s. Includes a Meccano T15 transformer, Gears Set and gears instruction manual. Also included, but not shown in picture are 3 manuals for the Instructions for Accessory Outfits, No 2A, 5A and 6A. Complete with manuals 0-1 and 4-5-6 and part of a much earlier manual/leaflet. One angled spanner missing but all other parts still in the box, including red and green mushroom pins. Cellophane and corrugated card internal box covers also included. Set is bundled with a late 1950s Meccano No.1 reversing clockwork motor (model 11010) with key and instructions (boxed). Collect from seller unless courier costs covered. The box is not pristine and there is no instruction book. But I think it is mostly all there. Its probably not worth huge amounts but someone might like it. Will anybody make an offer? Collection in person,or postage to be paid by buyer. Prefer for it to go to genuine enthusiast. Please contact by email if interested. 1950s Meccano outfit 8. This is a played-with toy, still with its original box. Has two construction manuals for outfit 6 and for outfit 7/8. It was stored carefully by my parents in their under-stairs cupboard for about 40 years and now needs a new home. Box shows its 60 year age and the pieces show they were loved and enjoyed. A large collection of used Meccano. From sets 01 & 02-03 (I think?) and a gear-set and clockwork motor, plus a few old instructions. These were bequeathed to me from my father but have no idea what to do with it. If anyone is interested please contact me and just make an offer. The set is quite heavy and weighs 7kilos. Incomplete Steam Engine, includes chassis, frame and boiler. There are over 1000 original 1950s pieces contained in the full wooden box and all those loose on the table. I think many are No.6 and 7 series but there seems to be some rarer items such as the airplane engine and propellers etc. There are also four motors, one of which is electric, three wind up. Also there are many original build guides. I have a collection of Meccano sets for sale. Please contact me for more picture or questions. I have a Meccano Airport Service Set (No.4) from the 1960s. All instructions and components intact. I would like £20 for it please. These two boxes of Meccano were bought for me as a young boy in the 1950s. There are no lids to the boxes. I am looking for offers. The buyer to collect from the Staffordshire area. Huge Meccano collection collected over decades by Canadian modeller. Multiples of every item in the catalogue, 16-18 motors, including steam engine, gears and specialty items. Endless plates, beams, nuts and bolts. Cool touches like Meccano tins and decals, cigar boxes and divider trays. Rare items like Roller Bearings, Digger Bucket, 4 1/4" Road Wheels, Channel Segments, masses of large circular parts, etc. etc. The Meccano System book and various classic magazines plus some images of the models created. Original 50s wooden chest, and many pieces, wheels, motors etc. Meccano Set No.9+. This set was collected from about 1951 to 1958. Many extra parts put the set half-way between No.9 and No. 10. Wooden cabinet with one lift-out tray. Overall condition good but with signs of natural use. Original instruction booklets, electric motor, transformer and clockwork motor included. Parts list available on request. Still boxed (the box is not in good condition). As can be seen in the photo lots of pieces but may not not be complete. Offers in the region of £25 plus postage which I think will be about £6. Meccano No.8 in red and green. Set complete except for about 10 small pieces. The set is in play-worn condition and original box is in bad condition. Some extra parts have been added to the set. The tray under the blue circular items contains a very large number of axles, cranks and handles. The clockwork motor is compete with key and runs well. Delivery from Surrey may be possible to South East region, by arrangement. Various Mecano parts approx 10kg. Not rusty but not in pristine condition. No boxes but nice wooden box if wanted. May be able to find an electric and clockwork motors. Probably better buyer collects near Chester UK. Over 3000 pieces of Meccano, excluding nuts and bolts. Includes one complete set 10. Condition poor (my old set 7) to unused, few parts reproductions. 4 electric motors, several MW model plans, mainly cranes. Two plastic storage units as well as what is in photo (this cabinet not included). Buyer to collect as heavy  Nottingham. 4 x 19a - Spoked Wheel. 44 x 101 - Heald for Loom. 5 x 106 - Wood Roller (NO rod or collars). All parts are in nearly-new condition, and were purchased from MW Models in the late 1970s. I am happy to sell the items individually. Large collection of Meccano. This collection is various 1970s childhood pieces (mainly set 2, I think, but am not sure) plus some pre-war pieces inherited from my father. It comprises over 1,000 pieces, with over 54 gears, 60 wheels of various sizes, 2 clockwork motors, lots of couplings, a couple of vehicle cabs, caterpillar tracks, several manuals and various other parts. Condition is variable, but reflects age and use. Further photos available on request. Prefer buyer collects, but will post at buyer's expense. Total weight 13.5 kg. Located near Edinburgh. Large quantity of 1970s Meccano comprising of No.6 set, 6x set, crane multikit , track set, 2 gear sets plus many other parts collected over the years. Most parts in usable condition but a lot of the plates have slight rust or have been bent. Smaller parts have been sorted into plastic boxes (included). Also 6 manuals and some leaflets. Wooden Top-Sign from a 6-drawer dealers' display cabinet. Measures approx 21 inches by 3 inches, another piece of wood has been added to form a base. Located in Lichfield Staffordshire, or can post at cost. Offers accepted plus postage & packing. Or collect from Andover in Hampshire, UK. Large wooden box of Meccano with thousands of parts. I started collecting metal Meccano kits in 1973. The result is the large wooden box with a lot of pieces. They are all mixed up together, but there are many, many parts. There are also lots of instruction manuals. All the parts for the original Meccano clock are also in there. This weighs a lot so postage is £24. You can also pick up if you want form near Middlesbrough. Meccano Set No. 5, motorised (G7505) dated 1978. Our son grew up too quickly so it was never opened or used. It is complete, as purchased and includes Books of Models for Set Nos. 1,4 & 5 together with 3 sheets of various self-adhesive labels. The box states that up to 69 models can be made but only one at a time! The box is in good clean condition and comes from our smoke-free and pet-free home. I can provide additional details and photographs if required. Box dimensions: 25 L x 18 W x 2 D ( 64 x 46 x 5 cm). Weight 3kg approx. Dark, Medium and Light green and red period. Parts to complete a ten outfit and much more. Sets in boxes, spare parts, electric motors. More pictures and list of parts on request. Meccano set 8 with many, many extras such as Meccano transformer type M20, 6 pulley (part 19c), propeller blades (part 41), ball thrust races and cage (parts 168a,b,c), hinged flat plates (part 198), and sprocket chain and wheels. These are only a small selection of the extras. There are nine instruction/model booklets. The Meccano parts are in used condition, not in original boxes. This was my fathers much-loved collection. I can provide more photos on request. I have a Meccano collection of my late father's to offer. I am unsure if all sets are complete but am happy to answer any questions, provide quantities of parts or add extra photos. The set is in used condition as can be clearly seen. Im on the Norfolk/Suffolk border for any interested parties. I have a large wooden box of Meccano parts from the 1950s that I grew up using as a young boy, that have been in my basement for many years. Many red and green components are hidden under the manuals - I can take more photos for an interested party. Probably an amalgamation of several sets, maybe not complete. Now, I would like to find a non-commercial collector or enthusiast, hopefully near Vancouver, that I can sell the set to for a nominal fee, or perhaps donate to a deserving individual. A large selection of Meccano, possibly 1950s, but some could be earlier. Sold as Seen. This belonged to my uncles and has been well loved and played with. It has been stored in the garage so elements are dusty with some surface rust on mainly the longer metal strips. Includes a large variety of pieces including a clockwork motor and 3 manuals (1 in German). Stored in a solid wooden box and includes lots of tins full of small parts including bolts and spanners. Offers welcome. Collection preferable (we are near Jct 8 M25) but will post at buyers expense. More photos available on request. Used 1970s Meccano 4M set. It comes with all the instruction booklets and diagrams. Due to age the box is not in perfect condition, however it is in very good condition. Please contact me on 07717417226. Meccano Set 6 in pristine condition. This set was found in the attic unopened, then opened and unstrung, then replaced in box. Four of the pieces have got tiny scratches. Other than that, the rest is unused. The original box that this vintage set of Meccano comes in is in excellent condition. The construction manual is also in pristine condition. Circa 1960/62 Meccano Secondary Modern Schools Outfit. This very rare Meccano light green set was an experiment to place Meccano within the secondary schools curriculum in the early 1960s, to produce roof truss assemblies and other types of angular structures. It proved to be less than popular and so only a few examples are known to have survived. One example being in the Meccanoland Collection in Holland (see images on n.z site). Interestingly the contents include 6 x 24.5" and 6x 18.5" Angle Girders and 8 x 9.5" girders. Also a large variation in strips etc. As the images clearly show. Large Meccano collection in very good condition, including at least one (likely two) full Set 10s and one Set 9. I was advised by my dad who owned the collection that it included two full sets plus additions but cannot officially confirm this  I do however have an eight-page set contents list which he compiled that can be shared on request. Itemised set contents show Set 10 1965-1969 and Set 10 1978  80. The above list does not seem to include Set 9, but I also have a full set of paper invoices detailing Set 9 (1950s Red / Green with 1970s contents) which can also be shared on request. Manuals and guides included. Additional photos showing contents of each container available on request. Meccano set in excellent condition. Seems to be Outfit No.10, unfortunately not in the original case. Not checked for completeness and no booklets available. Total weight including cases about 27.3 kg. Price £500 or best offer. Collection/pick-up preferred (The Netherlands), but will send anywhere at buyer's expense. Full set of detailed photos available on request. My boyhood Meccano collection from the 1950s. Basically No.4 plus many extras. Includes approx 150 red/green parts, 120 nuts/bolts plus additional accessories including No.1 Clockwork Motor in working order, plus instructions, Gear Outfit A, and 3 Instruction books for Outfit No.4, 4A and 5A. In well-used condition, stored in wooden and cardboard boxes. Buyer collects or can deliver locally (Derby area) or post at buyer's cost. Includes Sets 1, 3, 4, 5M, 6, 7, 8 and Super Tool Set, Gears Set and Electronic Control Set. All sets are complete. Contain all original Meccano parts in very good condition, some original, some repainted and some fresh plated zinc parts. All manuals are included. Electronics set is unused and box near mint. Other boxes in average to very good condition. Approx 45lbs. Would like to sell as complete collection. Located in SK Canada P/C S0A4J0. Will ship wherever at buyers expense. Collection of red, green and a few yellow/blue bits of mostly 50s/60s Meccano comprising sets 9 and 7, plus gears B set and a few motors. Played condition. No original boxes, but contained in 2 home-made wooden boxes. Overall weight is 45 lbs/20 kgs. Books for a number of sets and gears included. Buyer needs to collect from Lincolnshire, near Bourne. Meccano Outfit for Block Setting Crane. This is a made-up set and includes all of the parts required according to the parts list on the instruction leaflet, to build this model. It does not include the motor which can be obtained elsewhere (or an equivalent used). In purpose-built wooden box with lift-out trays and themed labels on tins and lid. All original Meccano parts with the exception of the hank of cord which is a single length, much stronger nylon equivalent. Parts are in good used condition, most of the painted parts having been re-painted to a very good colour match to the original. More pictures on request. For clarification, this is not a complete No.10 Outfit but does contain many of the parts found in a No.10 set. Wooden handle in un-opened original dealer packaging, part No.36a. Meccano Traction Engine, complete and in good condition. Engine is about 3ft long, 2ft high and 1ft width. Have several boxes of spare parts also to include. Sold as is. Parts are what is displayed. Not sure if complete. Box in good condition considering age. Item in Australia, will post. Cost will be negotiated with buyer. 1950s. Meccano 2a Accessories Outfit. In good condition. All parts appear present as per photo. More photos available at request. Literature in box. Item in Australia will post, cost to be negotiated with buyer. 1970s Meccano Conversion Set 3a. Convert Meccano Set No.3 to set No.4. The two strips are not in original packaging , not sure if original part or even needed to complete set. The rest are in original packaging, appears untouched. Box in good condition with a few minor marks from storage. More photos available if requested. Offers only. Will post overseas from Australia, please enquire to cost to buyer. Approx. 60 kg (excluding weight of storage units included in sale) of Meccano. Collected over the years to build models of 10 set size & above. Too much to photograph but I can provide a list in Excel format if required. Paint condition varies from excellent to poor but all parts are usable. Includes various DVDs, books, printed plans, & plate & strip bender. This item's contents remain unopened in original packaging. Item still in original plastic and therefore complete. The plastic has shrunk on the underside of the box which has caused the box to buckle slightly. This should resolve itself once opened. No creases. Offers only. Product in Australia. Will post if required. Cost of postage can be negotiated with interested buyers. 1960s Meccano, Number 8 plus extras. Two clockwork motors, one electric motor, plus gears and some Elektrikit. Located near Gloucester - can deliver or meet. Meccano Highway Vehicles Set No.3. Original box and manuals. Box lid has some damage. Unknown if set is complete. Manuals are in good shape as is the bottom of the box. Open to offers, plus shipping from Canada. 1960/70s Meccano, as seen in the photograph. Wide range of parts, most in good condition. Includes some construction manuals, three clockwork motors, three electric motors, and two micro motors. Whole lot to be sold collectively. I live in Edinburgh and it will have to be picked up. Including No 1 Clockwork Motor in box and with original key. Buyer collects from South East London. Parts in immaculate condition, substantially complete. Offers please. Please call my mobile 07438616570. 1958 red and green Meccano Outfit No 6. As far as I know there are no parts missing and it is in fully working order and well cared for. Every item and part is original. This includes 60-page instruction manual, motor and key, tin case with number 6 on which is full of parts. Guarantee certificate stamped VD 958. Every single part is stamped Meccano made in England. The box shows signs of wear and tear, however in excellent condition for its age. Large quantity of blue/yellow/zinc parts. All in used condition, zinc clean/polished, plates/wheels/pulleys generally good, brass patinated. Around 8,740 parts (comparison No.10, approx 3,140). More photos available plus detailed parts list/identification of parts stored in 3 boxes, strips, plates and wheels/pulleys/gears. Dont know value so all reasonable offers considered. Complete Meccano set No.8, in original box. Box original but distressed condition. Set includes instruction book for set No.7 & 8. Offers & Delivery for £17 or collect. Large selection of good condition Meccano. Suitable for designs in books 2, 3 & 4. Offers and package to be paid for £17 or collect. Brand new in case with sleeve. Collect from Maidstone, UK or will post at cost. I've got a lot of Meccano to give away. I've had it for years but no longer using it. Can somebody pick it up, or I can send it to you. Found these in the loft. Boxes not in great condition but not used. Complete with instruction booklets 3-7. Will post or can be collected from Edinburgh. Complete with instruction booklets 1-4. A limited edition '3 in 1' Meccano Speedplay set (Robot, Crane, Trike) which I believe was issued by Marks &Spencer in 2005. The set is unused, complete, with instructions - all parts being contained in their factory-sealed bags. Seller based in West Yorks (UK). Best offer over £30 will secure this uncommon item. I want to sell this kit. It is in very good condition. To my knowledge there is one small brass pulley missing and one of the tools. Meccano Construction sets 2 and 3. Was mine and my brothers as kids. Selling together, as parts will be mixed between the two sets. Meccano Special Edition Train set in Meccano plastic case together with Transport set. Sets are in good condition for their age. Some parts show little sign of use and some nothing at all. It comes with the relevant Meccano manuals. Collection from Shaftesbury, Dorset or will post at cost. Please email for better photos/information. My grandads Huge Meccano collection is very extensive and consists of some components from 1920s to Id say the early 90s. According to his inventory there are over 12,000 parts, not including nuts and bolts. Most are (to the best of my knowledge) from number 10 sets, there are some whole sets and lots of Meccano Magazines from the 1940s through to the 1970s. Open to offers. Please note, the tool chests are not included in the sale. Collection of various Meccano components, in excess of 800 pieces plus several containers of fixings. Including 2 x clockwork motors, tools and wheels. Most items are believed to be 1930 to 1940s, although there are some modern pieces, some odd pieces appear to have been repainted. Also included are some instruction manuals in varying conditions. Not in original box. More photos available by request. A collection of original black rubber Meccano tyres, which are in excellent condition and still pliable with no cracks, although one of the 3" ones has a slight defect on one side. 6 each of part Nos. 142a, 142b and 142c. The best offer will secure these increasingly rare items (est. £55 to £60). We have a huge amount of Meccano pieces some in reasonable condition some a little rusted. The picture shows just a few of them. We have the instructions to set one so presume that a lot of the pieces are included. There are obviously parts of a small aeroplane and some larger parts including wheels and spring mechanism. We can send further pictures if anyone is interested. To be picked up in Birmingham or sent at buyer's expense. 1920s Meccano set in wooden box with 3 instruction books (one shown in photo, the other two in poorer condition with cover and first pages missing). This set belonged to my father (born 1910), so I assume it is from 1920-25. Models in the books include WW1 tank and other vehicles of that era. A few pieces have a little rust but mainly in good condition. I can't guarantee that the wooden box is original (no name on it) but the base of it is compartmentalised as are the trays. Maroon in colour and made from a very interesting material, with two Meccano images. This would make a superb addition to any Meccano connoisseur's collection. The item appears never to have been removed from its original cellophane sleeve. Best offer over £20 will secure this rare item. Exact age unknown but most likely post war but pre 1970. Contact to arrange collection or postage if you are interested. 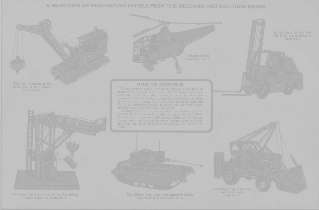 Illustrated is one of eight boxes containing over 1500 pre or post-war parts. The other seven pictures can be sent and also a list by colour, condition and quantity for each part; but please consider them all as one lot. Mixed lot of various pieces in used condition. Collect from South Devon or will post (Approx 5 kilos). Mixed lot of Meccano, Teknik, Konstruktoren, and other sets. The box is complete however the lid sides have become detached. The set pictured is believed to be complete. There are 3 sets of instructions for the various sets, in English and Finnish. I cannot be sure that these are all complete, but there is far too much Meccano in the box for just the crane. The original tools are included. I have individual pictures of the bits and pieces, if interested please email me and I can send the pictures over to you. Offers please. I can post the sets off to you at your cost. I will let you know the cost before posting to see if it is mutually acceptable. Collection is welcome. My fathers collection of 1960  1980 Meccano reference material is looking for a good home. Includes catalogues of obsolete literature and parts by G.M. Morris, G Coles, J Westwood and others. All in excellent condition. Offers sought - and will be accepted if at least covering the cost of 1 kilo postage from Wales! Issue nos. 1 - 121. and Special Edition No. 1. Bound in 13 original red binders. Includes 9 coloured index sheets for issues 13-83 and Bill Thacker's 90th Birthday CQ presented with issue no.68. All read but in excellent condition. Buyer to collect from Preston area, England, or can be shipped anywhere at buyers expense. One No 140 (Outfit 0) dated 1914. One No 14 presumably earlier. One (without covers) somewhere 1920s/30s. The Meccano Magazine 1916-1981. The Hornby Companion Series Volume 7. It deals with the history, images and content of Meccano Magazine. Asking $70 (Canadian dollars) plus postage. Shipping and postage costs can be determined in advance with interested buyer. An excellent copy of the Vol. 6 (Meccano Systems) book. Increasingly sought after these days. Sensibly priced at just £45 (plus p&p). Meccano Engineer - Issues 1-12 Complete. Published by MW Models in 1973-76. The magazines are in good condition. They weigh nearly 1kg, so postage in the UK will be £3.50. A rare 1930 factory-bound instruction book. Red with gold lettering on cover. Contains 00-3 (30A) instructions, 4-7 (30) instructions and Standard Mechanisms. In very good condition, being clean with crisp pages & well preserved. I think the photo tells you everything about this item, which is complete and for which I would welcome offers. It can easily be delivered by post. Meccano Info and Product Booklet. 1949. South Africa. Mint condition except tiny smudge to back cover. This booklet really is in the most amazing condition. 22 Pages. Will post worldwide. Five Meccano catalogues, 1936 to 1956. August 1936, 1938, August 1939, 1939-1940, July 1956. Condition: August 1936 example is missing its cover as is August 1939. The rear cover of the 1938 example is detached. Otherwise good used condition commensurate with age. Further details available if needed. 1927 the new Meccano Engineering for Boys. All colour catalogue this is a rare item. The price is £160 ono. 1924 Birthday Gifts for Meccano Users. This is a very rare leaflet. And is the first I have seen in over 40 years of collecting Meccano. So I am asking for sensible offers please. 1916 Nos.1 and 2. 1917 Nos.3, 4, 5. 1918 Nos.6, 7, 8. 1919 Nos.9, 10, 11. 1920 No 13. 1921 No 20. 1922 Nos.22, 23, 24, 25, 26, 28, 29. 1923 Nos.30, 31, 32, 33, 34, 35, July, August, September, November, December. 1924 Jan, March, Aug, Sept. 1925 Sept, Dec.
"Meccano" is a registered trademark of Meccano SA, Avenue de Saint Exupery, Calais 62100, France. I am a Meccano enthusiast, and have no connection with Meccano SA. The name "Meccano" is used on this web site only as a means of referring to the construction set of that name, and not to infringe any trademarks.